Same old story about an arranged marriage. Nevertheless it is nicely told and the production is good. 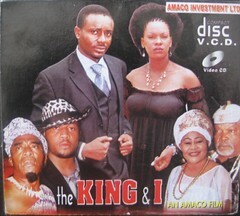 Chiege plays a princess, the only daughter to the King of Agabi Kingdom. Emeka Ike is Martins, a medical doctor from a poor background that Princess had a crush on in school. Mike E plays Tony the arrogant son of “The Governor,” who the Princess’ parents have betrothed her to. Chiege comes back from London only to find out that her parents want her married to solidify their relationship with the Governors family. Chiege busts in with an American accent despite us being told that she has just come from a long stay in Jand… Wetin be dis now? The other discrepancy that I found quite noticeable in the film was the difference between the Junior Chiege and the Senior Chiege. The actress that was her junior was waaaaaaaaay waaaay darker than Chiege. They should have used someone else just to add to the creditability factor. Really my dear! Like what? LOL that made me laugh. Can you imagine? If I was him I would have thrown something at her… Nonsense!!! We see Tony the Governor’s son snorting coke. He sits with his thugs around the table and it is a white powder free for all snort up. All of them are sitting there with white powder spread across both nostrils. It was a bit over the top and looked fake. This scene is almost an insult to the viewer as we do not need to see a nose with white all over the external of it to know cocaine has been taken!!! The story ends happily with the family uniting after Martins performs life saving surgery on the King. By the end of the film Martins is running a hospital despite the obstacles placed before him. Both family’s are together to bless the union of Martins and Princess when the news comes on and we see that Tony has been arrested for some drug offence. This film teaches us that you should never judge someone for what they are today as you do not know what tomorrow holds. It also teaches us to be compassionate no matter a person’s situation or family background. The very person that the king fought so hard to bring down was the same person that saved his life. Yeah it was aiight. Haven't seen Chiege in ages. I guess she is off the Nollywood scene now. Please, where is Chiege Alisigwe? She used to be a favourite of mine then she just disappeared. Abi dem don ban am? LOL! Would really like to know what she's up to dese days. Nolly, any ideas? hmmm I don’t know. If I get any infor I’ll come back and report here.